Ocean themed clear stamps from Picket Fence Studios featuring ocean waves. Unique, beautiful and creative stamps designed by Nicole Petersen. Use with paints and inks. Perfect for card making, journaling, scrapbooking, and mixed media. Cling Stamp featuring beach chairs. Deep Red stamps are made of a blend of natural rubber and are attached to a cling foam pad for better definition. Clear stamps from Uniquely Creative featuring birthday sentiments, divers, a dolphin, a sea turtle, and a shark. Ocean themed clear stamps from Uniquely Creative featuring birthday sentiments, a mermaid, a whale, an octopus, a seahorse, and a crab. Ocean themed clear stamps from Picket Fence Studios featuring whales and the sentiments "Never give up hope", "I'd follow you anywhere", "You matter to me more than all the fish in the sea", and "All you need is a dose of vitamin C". Unique, beautiful and creative stamps designed by Nicole Petersen. Use with paints and inks. Perfect for card making, journaling, scrapbooking, and mixed media. Cling Stamp from Impression Obsession featuring a sign that says "Good Life Beachside". Marianne Design Clear Stamp: Hetty's Mermaid. 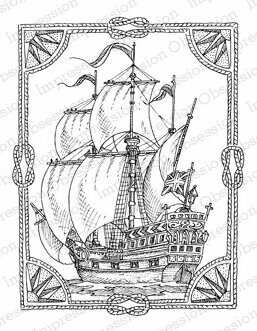 Make a nautical card or girl card for any lover of the sea. Coordinates well with HT1618 - Fish in the Reef to create many different scenes. 11 pcs. Size: 3.74" x 5.51". Cling Stamp from Stamping Bella featuring an ocean scene with a mermaid and a treasure chest. A Frantage beauty deep in the sea with floating hair and a special friend. This mermaid will be the centerpiece of your summer scrapbook pages, correspondence and greetings. This quality wood-mounted rubber stamp is made from deeply etched, precision trimmed premium grey rubber. With 1/8" thick grey foam for a smooth impression on uneven or textured surfaces, it is mounted on a contoured hardwood block and indexed with a black image on a full sized decal. The image features original artwork designed by Fran Seiford. Image size is approximately 3" X 4 1/2". Cling rubber stamp featuring beach chairs. Darkroom Door Photo Stamps are mounted on cling foam. Suitable for card making, art journals, mixed media and more! Darkroom Door rubber stamps are known for their durability, deep etching and high image detail. Tim Holtz Cling Mount Stamps: Sea Life. 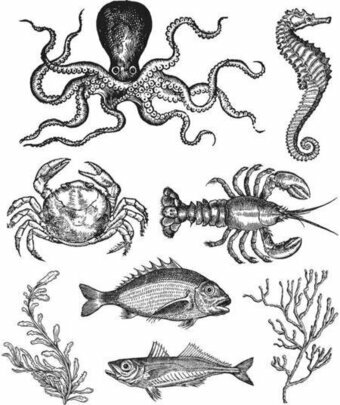 Features a crab, a lobster, an octopus, fish, and coral. Eight deeply etched red rubber cling mount rubber stamps that adhere to any clear acrylic block. Octopus measures approximately 4 9/16" x 2 3/4", coral measures approximately 1 3/4" x 2 1/2". Stamps come on a 3-hole punched sheet for easy storage. Cling Stamp from Stamping Bella featuring an ocean scene. Ocean themed clear stamps featuring a porpoise, a whale, a sandcastle, and more. Hero Arts 4″x6″ clear stamp sets offer the best quality in the market. They are made in the USA from genuine photopolymer, which is non-toxic, biodegradable, and designed specifically to transfer ink to paper for a true impression every time. Peel off your stamp from its backing and stick to an acrylic block for easy positioning. Mix and match the designs, then clean with water or stamp cleaner. Ocean themed cling stamp featuring a mermaid and fanciful fish.